I actually temporarily lost my pair while I was cruising (very traumatic!). I sent them off to be washed and they didn't come back with the rest of my stuff! When I looked for them to wear the next day I couldn't find them. 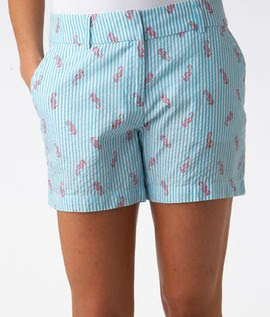 I tried to describe them to our cabin steward but he definitely didn't know anything about seersucker or critter shorts (I think I threw in something about pink seahorses too-sorry Agus!). I called the front desk and tried to give a less confusing description of the shorts. An hour or two later the shorts were back! Crisis averted! Those shorts are adorable and look great for the summer! We've added some nautical designs you may enjoy! You may be interested in checking out our new giveaway at candpstationery.com for a chance to win Free coastal, preppy note cards! Those are very cute shorts! I have a white pair from J.Crew with silver metallic elephants on them. Glad you got your shorts back. By the way, I'm so jealous of your wonderful trip! As Midwest Prep said, every time I see an Anchor I think about how much you would like it! I guess we love your blog and all the wonderful Nautical items you find. I love these, I would have been upset too! I like that these aren't too short. Cute! well they are super cute, i can see why you own a pair. OOh thanks for the tip! I am in dire need of new shorts! So glad you got your shorts back! They're adorable! that's so frustrating to have other people lose your things! good thing you got them back!